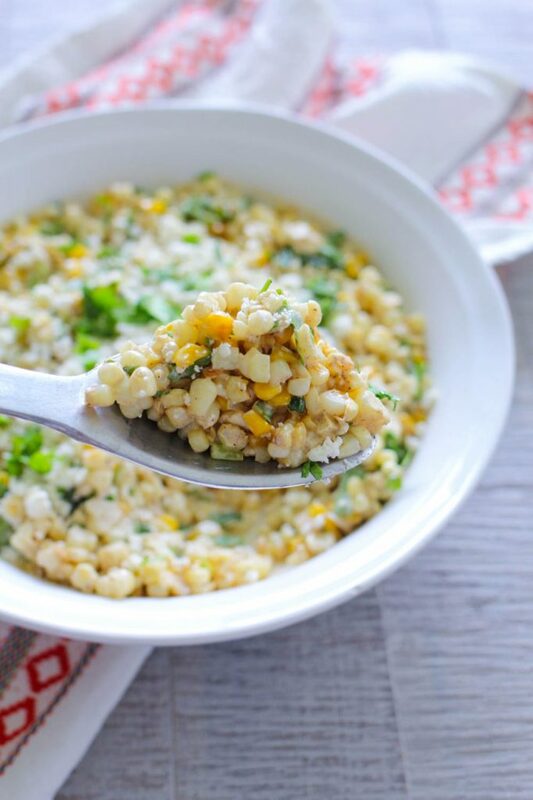 Mexican Street Corn Salad is the perfect way to celebrate all the fresh corn from this season. It’s incredibly easy to make and packed with Southwestern flavor. If you love Mexican Street Corn, or just corn itself, you’ll love this recipe! It’s September, that means corn and tomatoes are in season and life is GOOD. It’s probably a crime not to use fresh corn and fresh tomatoes this time of year. And soon, they will disappear. So if you don’t have any, go get some now! I may sound a little dramatic but there’s nothing better than local produce. 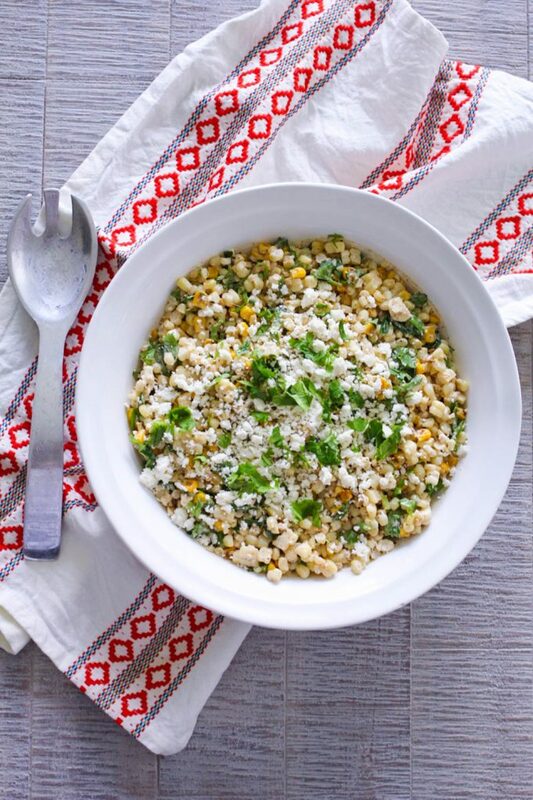 Mexican Street Corn Salad is one of those dishes you’ll want to make over and over again. If you’ve ever had Mexican Street Corn, you know what I’m talking about. The combination of ingredients is irresistible. 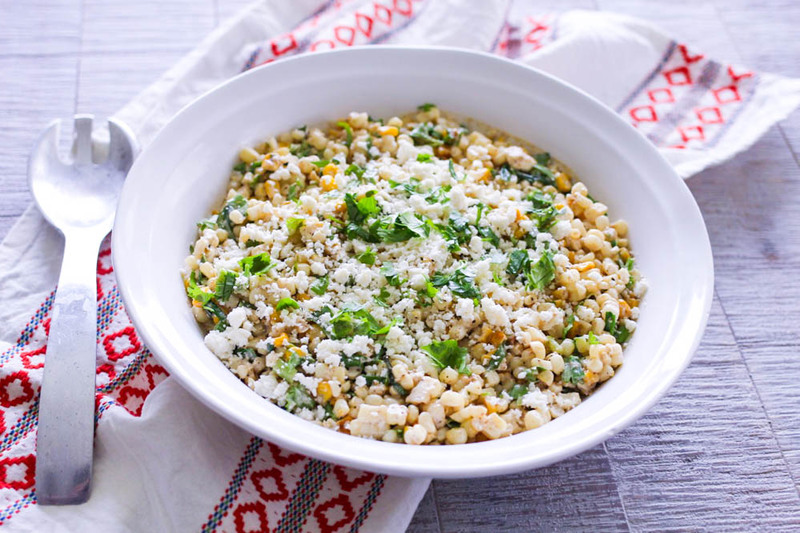 Corn, crema, queso fresco, cilantro, chives, and a few spices, all mixed together into a crunchy and flavorful side dish… yes please! And did I mention how easy it is? I think I did. Just toss the ingredients together in a bowl and serve! September also marks the beginning of FOOTBALL season (go Utes!). That means tailgating, lots of yummy food, and great memories. Mexican Street Corn Salad can be made up quick if you’re in a hurry or it can be made ahead if you’re planning for a bigger crowd. It can be served warm or chilled, and pairs wonderfully with grilled meats, like Grilled Fajita Shish Kabobs, Lemon Pepper Chicken Kabobs, or Grilled Flank Steak. The leftovers are also AMAZING in quesadillas with a little bit of cooked chicken! Mexican Street Corn Salad is sure to be a side dish staple for all of your fall bbqs, potlucks, and tailgates. A little creamy, a bit of crunch, and a whole lot of southwest flavor. It’s fun twist on an old favorite and a great way to use up fresh corn. If you’re looking for a salad that will go with really anything, from pulled pork to burgers to tacos, this is it. I know you’re going to love it. Grill corn in husk on medium/high for 6 minutes, turn, then grill 6 more minutes. Cut kernels from the cob. Grill green onions, 1 min on each side or until lightly charred- turning once (You don't have to grill green onions, but it does give them a great flavor!). Or use frozen corn, roasted in a pan with 1 tablespoon olive oil. In a bowl, toss corn, mayonnaise, sour cream, lime juice, chili powder, chopped green onions and 2 oz queso fresco. Top with additional queso and cilantro. Serve warm, room temperature, or chilled. This recipe is best when made with fresh corn on the cob, however if fresh corn is not available, you may use frozen corn. Do not thaw before using. When using frozen corn, remove about 1-2 cups and sauté in a pan over stove on high heat using a little olive oil in pan. Cook the corn until it starts to brown a bit. Then add to the remaining frozen corn in bowl. Proceed with recipe directions. I love your blog and recipes! I have to tell you that I think you were inspired to post this recipe today. 🙂 My son leaves on his mission to Puebla, Mexico in 16 days, and I came on to your site just now to get some good Mexican food ideas for his farewell. This looks fabulous and will be perfect! I think I’ll check out the Fajita Kabobs as well. And of course some yummy desserts! Thanks so much for sharing your delicious and beautiful recipes with all of us! You’re very welcome, Kristy, I’m glad you found ABK. There are a lot of wonderful Mexican style recipes here. And that’s so exciting for your son! One of my son’s served his mission in Mexico too. Thanks for sharing! Could you use Trader Joe’s frozen roasted corn for this recipe? Hi Susie, yes that should work just fine. Thanks for asking and for reading ABK! Hi! 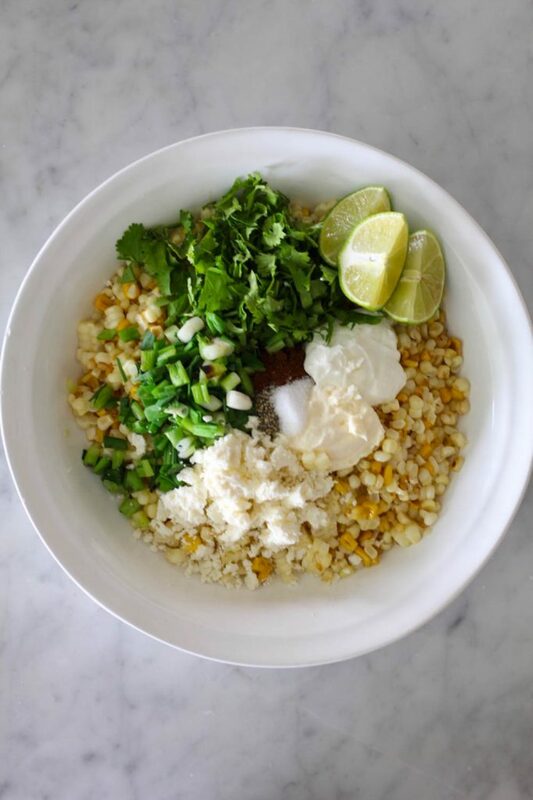 I’m planning to make the Mexican Street Corn salad this weekend and had a quick question–the recipe calls for Queso Fresca, but in the description, you say Cotija. which is it? They are different!